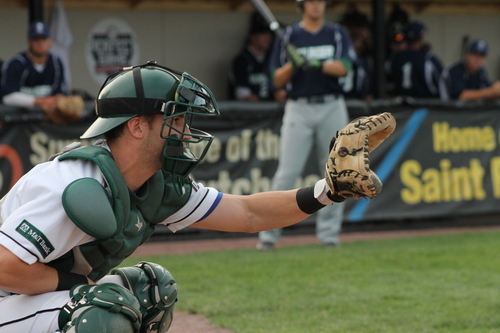 There are 48 days left in the PGCBL regular season, which ends on July 30. Amsterdam 14 Mohawk Valley 3: The Amsterdam Mohawks scored multiple runs in four of the last five innings, including a six-run eighth, to beat the Mohawk Valley DiamondDawgs, 14-3, in Little Falls. The game was scoreless until the fourth inning when an error allowed Brendan Tracy to score the game’s first run. The Mohawks then scored three runs in the top of the fifth on a Justin Yurchak RBI single, a double play and a Tyler Kirkpatrick RBI double. In the next inning, Tom Moore hit a solo home run and a passed ball allowed another run to come across. Both teams scored two runs in the seventh, with Amsterdam’s coming on an Aiden McDermott two-RBI single and Mohawk Valley’s coming on an error and an RBI groundout. The Mohawks then scored six runs in the eighth inning, including two on a Scott Manea two-RBI double. Fernando Guerrero tossed five scoreless innings from Amsterdam, while Marcus Failing allowed a run in four innings to take the loss for Mohawk Valley. Saugerties 5 Elmira 1: The Saugerties Stallions used a solid start from Anthony Rocco to lead the Stallions to a 5-1 win over the Elmira Pioneers. Rocco tossed seven scoreless innings, allowing just four hits and striking out three batters to earn the win for the Stallions. Rocco got some early run support as Dylan Sprague hit an RBI double in the bottom of the third to give Saugerties a 1-0 lead. In the seventh, Cole Clifton hit a two-out RBI single to extend the lead to 2-0. Elmira cut the lead in half in the top of the eighth on an RBI fielder’s choice. In the bottom of the eighth, thought, Pat Dorrian hit an RBI single, a bases loaded hit by pitch and a bases loaded walk gave Saugerties some insurance. In the loss, Jared Proctor tossed six innings of one-run ball for Elmira. Glens Falls 7 Utica 2: The Glens Falls Dragons used two three-run innings to win their second game in a row, beating Utica, 7-2. The scoring started in the top of the second, as Nick McIntee hit an RBI single for Utica. Glens Falls answered in the home half, scoring a run on an error. The bottom of the fourth was the first of the two three-run innings. Zach LaFleur hit a two-RBI single and Joseph Libio added an RBI single of his own to account for the three runs. An RBI groundout in the top of the fifth scored the second run of the game for Utica. In the bottom of the sixth, though, an error, a balk and a passed ball allowed three Dragons to score, finishing out the game’s scoring. Cameron Churchill allowed two runs over six innings of work, striking out five, in earning the win for Glens Falls. Collin Gee gave up four runs (three earned) in taking the loss four Utica. Newark 4 Adirondack 3: It took 14 innings, but the Newark Pilots beat the Adirondack Trail Blazers, 4-3, on Thursday night, winning in walk off fashion. The Pilots got out to an early 1-0 lead in the bottom of the first on a Willy Yahn, who went 5-for-5 on the night, RBI single. Adirondack scored two runs, one on an RBI groundout and the other on a sacrifice fly, in the top of the fourth to take the lead. A Mike Lanza RBI single for Newark in the bottom of the seventh knotted the game at two. Six scoreless innings later (including four in extras), Adirondack took a 3-2 lead in the 14th on a bases loaded walk. In the bottom half of the inning, an error, a single and an intentional walk loaded the bases with one out for the Pilots. A wild pitch with Frankie Gregoire batting allowed Mike Lanza to score, tying the game at three. After Gregoire struck out, Anthony Spina hit a walk-off single, giving Newark the win. The game was the longest in the PGCBL this season and Yahn’s five hits are the most in a single game for a PGCBL player since Tanner Giesel (Newark) had five against Watertown on July 22, 2014. Victor 12 Albany 1: The Victor RailRiders crushed the Albany Dutchmen, 12-1, in their first trip to the Capital City, moving into first place in the West Division in the process. The RailRiders scored two runs in the first inning to get out to an early lead. The visitors added four more in the second inning, with three coming on a Nick Boland double. Albany scored their lone run in the bottom of the fifth on a Sean Aspinall RBI groundout. Victor scored six runs in the sixth inning to seal the win. Three RBI singles, including a two-RBI single from Nolan Schultz, and a two-RBI double from Boland accounted for the runs. Mitch Patishall earned the win for Victor, while Chris Amorosi took the loss for the Duchmen. Newark at Victor 5 p.m.: The first-place Victor RailRiders, coming off a 12-1 win on Thursday, will play host to the Victor RailRiders in a West Division matchup. Adirondack at Mohawk Valley 6:35 p.m.: Both Adirondack and Mohawk Valley will look to get back in the win column as the DiamondDawgs play host to the Trail Blazers on Friday. Saugerties at Amsterdam 6:35 p.m.: The top two teams in the East Division will face off at Shuttleworth Park on Friday as Amsterdam hosts Saugerties. Utica at Elmira 7:05 p.m.: The Utica Brewers will travel to Elmira for the first time this season as both teams look to rebound from losses on Thursday night. Glens Falls at Albany 7:05 p.m.: The Glens Falls Dragons will look for their third win in a row as they travel to Albany to take on the Dutchmen.